Greater than/Less than. . Wallpaper and background images in the Harry Potter vs Twilight club tagged: twilight harry potter better greater than less than math symbol. See! That's why I don't like mathes! Since you can do math over this, so can I. 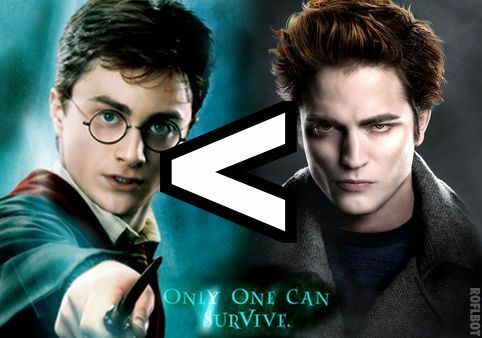 ^ but Voldemort had Cedric killed... and Harry killed Voldemort... so I find your equation slightly confusing. Voldemore killed Cedric because he was in the way. Cedric showed bravery when he stood up to Voldemort, so he was the real winner. But Harry's still better than Voldemort for facing death, whilst Voldemort takes desperate measures to run from it. So really, neither of them make sense *shrugs* OWELL. Cedric never stood up to Voldemort. Cedric held his wand up to Voldemort when he appeared. Well, if you look at the situation carefully, Cedric didn't know that bundle was Voldemort. Even Harry didn't know at first. Cedric just held up his wand in a defensive position, just like most wizards and witches would do in a dangerous situation. Thus standing up to Voldemort. knowingly or not, it still happened.